In fewer than 100 days - on Monday, 18 June - England will take to the field for their opening match of the 2018 World Cup against Tunisia. 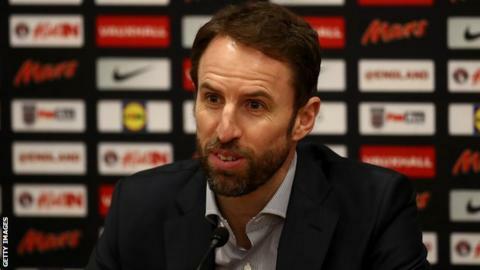 Before then, manager Gareth Southgate must decide who he will take to Russia - a task he has described as a "complex minefield". He says players "need to be playing regularly" and "in good form" - but does his latest squad reflect that? After the announcement of a 27-man squad to face the Netherlands and Italy this month, BBC Sport picks out four key charts to highlight Southgate's issues. The absence of Harry Kane with an ankle injury has underlined the problems England would face were their leading striker to miss the World Cup. The three central forward players named in Southgate's latest squad have 23 international goals between them, and Danny Welbeck has scored 15 of those. Welbeck has only started eight Premier League games this season, scoring just three goals, but did net twice in Arsenal's victory over AC Milan on Thursday. Southgate has overlooked Brighton striker Glenn Murray, the fourth highest-scoring Englishman in the league this season behind Kane, Raheem Sterling and Jamie Vardy. Southgate has named four goalkeepers in his squad, with Burnley's Nick Pope called up for the first time to join Joe Hart, Jack Butland and Jordan Pickford. Pope is the man in form, and the statistics suggest his call-up is richly deserved. But he has never played at international level. Hart, meanwhile, is by far the most experienced of the quartet with 75 caps but has played just 15 times for West Ham in the Premier League in 2017-18. Three of his errors have resulted in goals, compared with one from Butland and none from Pickford or Pope. The 'expected goals prevented' calculation by statistics company Opta is also overwhelmingly in Pope's favour. He has prevented 10 expected goals this season - the second highest in the Premier League behind Manchester United's David de Gea. Pickford is next in the list, while Hart's tally is the third worst in the league. Old guard out in defence? Southgate said it was "probably a very difficult call" to drop Chelsea defender Gary Cahill, who would have been the second most-capped player in the squad had he been selected. The 32-year-old has featured in the past three major tournaments for England. Manchester United's Chris Smalling, who has 31 caps, is also absent as Southgate hands opportunities to a number of new faces in defence. Burnley's James Tarkowski and Swansea's Alfie Mawson have been called up for the first time, and Southgate has also opted for Joe Gomez (Liverpool) and Harry Maguire (Leicester), as well as the more experienced Manchester City player John Stones. There are just 27 England caps among the central defenders named by Southgate - 23 of which have been won by Stones. Is the Premier League to blame? In announcing his squad, Southgate said: "It's obvious to everybody we have a very small number of English-qualified players in the Premier League." Premier League clubs have selected 168 English players so far this season. That tally - 33.8% of the total - is just one player fewer than in the season before the 2014 World Cup, but 15 fewer than in 2009-10. Southgate may have little option but to choose players with limited experience at both domestic and international level, and has shown he is not afraid to do so. The 27 players in his latest squad have won 506 caps between them. That is significantly fewer than the winning squads at the past two tournaments - before their successful 2014 campaign, Germany's squad boasted a combined 974 caps. Will Southgate continue to select those with lesser experience come the summer? That's just part of that "complex minefield" he faces.